righter, more artistic web pages, and practical in the same time is our goal every time we start designing a page for our customers who look to take the step of being at the world finger tips. With the best servers to host you fantastic web site and of course giving you our services with accepted cost The Number of sub pages, adding dynamic components, estimated time, and the final price depends on the provided information by our customer. 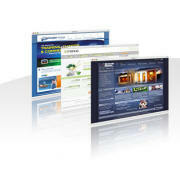 Our services include web site design, maintenance, hosting and providing ecommerce facilities. Technologies include most common web languages. Our prices are very competitive. cause we always want to give a hi standard services with at lower prices as possible just to make our customer feel better with our services. We are offering training on Basic design, maintenance, and using hosting control panel, when it required by the customer, our professional team have a wide experience in training and make sure our client improving his skills in order to control his own web site. You can visit us on Impulse company, or you can chat with website support on messenger (skype: impulse.co). We will discuss your requirements and ideas then work out what the best plan of action is for your website.